President Trump has tweeted a short video clip of him wrestling a person with the CNN logo for a head. The clip is an altered version of Donald Trump’s appearance at a WWE wrestling event in 2007, in which he “attacked” franchise owner Vince McMahon in a scripted appearance. The animation appears to have been posted to a pro-Trump internet forum earlier in the week. CNN later accused President Trump of inciting violence against the media. The clip was submitted to a Donald Trump forum on the social media site Reddit four days ago, where it became one of the most popular posts. After Donald Trump’s tweets, Reddit users expressed disbelief at the president’s use of the clip. It was also re-tweeted by the official presidential Twitter account, @POTUS, operated by the White House. Donald Trump has repeatedly clashed with CNN, which he calls “fake news”. On June 29, the president launched an attack on MSNBC hosts Mika Brzezinski and Joe Scarborough. His tweets were condemned by Democrats and Republicans alike. Donald Trump has an entry in the World Wrestling Entertainment Hall of Fame for his appearance in the franchise a decade ago. 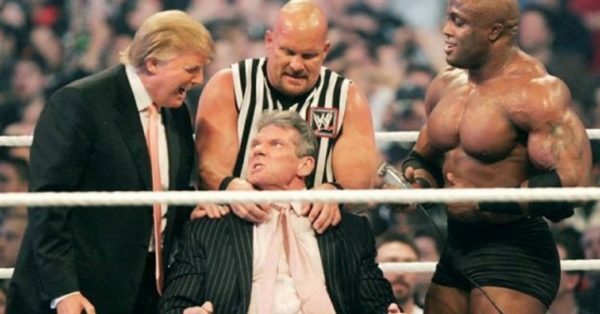 In 2007, franchise owner Vince McMahon challenged Donald Trump to a so-called “Battle of the Billionaires” at a Wrestlemania event, with a wager that the loser would have their head shaved. The US professional wrestling scene is largely pre-scripted and seen as a form of entertainment rather than a sport. Rather than fighting directly, each business magnate backed a performer. Donald Trump’s wrestler was victorious. However, on the sidelines of the ring, Donald Trump performed his scripted attack on Vince McMahon, providing the original video for his beat-down of CNN. Donald Trump then helped to shave Donald McMahon’s head on TV.